Stainless steel, nonrusting or rustproof is an alloy of iron (nickel (Ni)) and a minimum of 10.5% to 25% chromium (Cr) and up to 1.2% carbon. Typically, a combination of chromium and nickel is used, for example, 18% Cr and 8% Ni, because nickel resists a number of undesirable effects of chromium. In many types of stainless steel are also molybdenum, titanium, manganese, nitrogen, and silicon found. Stainless steel is resistant to oxidation and corrosion. Due to the chemical compound which enters into chromium with oxygen, there is a thin, transparent oxide film on the steel formed in the presence of a 12% chromium. Which may be affected by a chloride solution such as sea water or chlorinated pool water. The result is localized pitting corrosion. 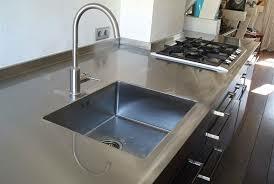 - Stainless steel INOX: is steel containing 18% chromium and 10% nickel. - Ferro Chrome: contains 45 to 85% chromium and is highly corrosion resistant.